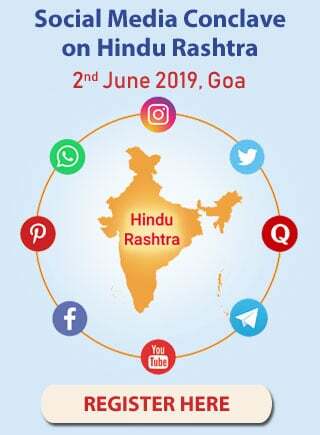 Home > Hinduism > Hindu rituals > Shradh – An opportunity to repay debt to our ancestors > When, where and by whom should Shradh vidhi be performed ? 1. Who should perform Shradh vidhi? The Shradh rites should be performed by yourself. 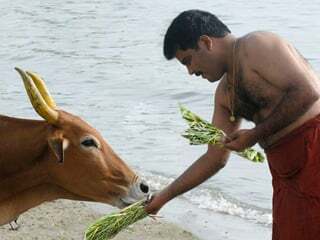 However, since we do not know how to perform it, we get it done through a Brahman. There is a great deal of similarity between the vibrations of the pitars and their closest descendants. When a particular subtle-body experiences pain, his nearest descendants also experience those troublesome vibrations. It is for this reason that the son has to perform rites such as annual Shradh vidhi and Shradh performed in Pitrupaksha for the sake of pitars. The vibrations of the son and the vibrations of the pitars are similar and hence, pitars find it easy to imbibe the tarpan offered by the son during the Shradh vidhi. to not perform Shradh due to the absence of a particular individual ! Son (including one, whose thread ceremony has not been performed), daughter, grandson, great grandson, wife, daughter’s son (if he is one of the heirs to the property), real brother, nephew, cousin’s son, father, mother, daughter-in-law, children of elder and younger sisters, maternal uncle, sapinda individual (anyone from seven generations and belonging to the same family lineage), samanodak individual (anyone after the seven generations and belonging to the same gotra (The same family domain), disciple, upadhyay (Brahmans), friend, son-in-law of the deceased individual – in that order, if the first is not available then the next in line can perform Shradh. In the case of a joint family, the head of the family (eldest in the family or one who shoulders the responsibility of taking care of everyone) should perform all the Shradhs. 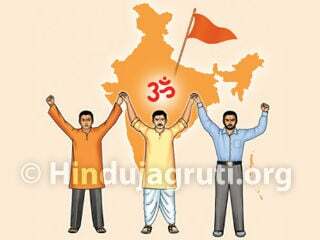 Hindu Dharma has made an arrangement so that Shradh can be performed for each and every deceased individual, so as to provide the individual with momentum. It has been mentioned in the Holy text Dharmasindhu that, ‘If a deceased individual has no one to perform Shradh, then it is the duty of the king to perform that individual’s Shradh’. Some Brahmans in the present times (who conduct Shradh rites) deny their consent for women to perform Shradh vidhi. This is because in the earlier days, the thread ceremony was performed on women. In the present times, this practice has been discontinued in all the classes and therefore, even the practice of performance of Shradh vidhi by women has been discontinued. In emergency situations, however, if no one is available for performing Shradh vidhi, it is better that it be performed by a woman, than not performing it at all. 2. When should the Shradh be performed ? Generally, tithis considered appropriate for performing Shradh are – Amavasya, 12 Sankrantis in a year, solar-lunar eclipses, Yugadi and Manvadi tithis (Tithis of commencement of Era and Manvantar), Ardhodayadiparva (A measure of time), date of death, arrival of shrotriya Brahmans, etc. Shradh was not performed due to non-feasibility in a particular period ! Normally, Shradh should be performed every year on the tithi of death of the individual (and not on the date as per the English calendar). If the tithi is not known and only the month is known, then the Shradh can be performed on the Amavasya of that month. If both, the tithi as well as the month are not known, the Shradh can be performed on Amavasya of the month of either Magha or Margashirsha. Shradh for the pitars should be performed every day. It can be performed simply through tarpana. If the day is divided into 5 parts, the fourth part is called the ‘aparanha’ period. This period is most appropriate for performing Shradh. 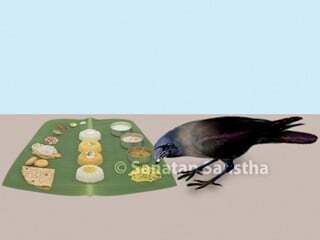 The tithi of Deity Brahma’s day is considered as the first tithi and is termed Kalpadi tithi. The Chaitra Shukla Pratipada and Panchami, Vaishakha Shukla Trutiya, Kartik Shukla Saptami, Margashirsha Shukla Navami, Magha Shukla Trayodashi and Phalgun Krushna Trutiya are Kalpadi tithis (Tithis that mark the measure of kalpa – a measure of time). The scriptures mention that if the Shradh is performed on these tithis, the pitars get satisfied. Akshayya Trutiya indicates the start of the Krutayug (Satyayug – The first in the cycle of four Eras). Rites such as Shradh, tarpana, etc. for the pitars and donations on this day become eternal; therefore, apinda Shradh (Performed without offering the pinda) or at least a tarpana should be performed for the pitars on this day. It is mentioned in Garudpurana that, once donations are made in the name of the deceased individual on this day, the Yamadoot (Messengers of Deity Yama) do not cause trouble to the pitars. The dark fortnight in the Hindu lunar month of Bhadrapad is termed as ‘Pitrupaksha’. This fortnight is very dear to the pitars. 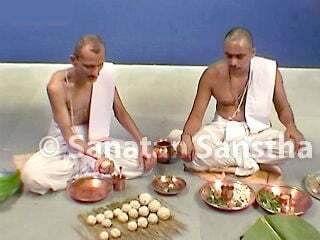 If Mahalaya Shradh is performed for the pitars during this fortnight, they remain satisfied throughout the year. If Shradh is performed when the Bharni lunar asterism is in position during Pitrupaksha, it yields benefit equivalent to performing a Shradh at the Holy place of Gaya. As per the scriptures, Bharni Shradh should be performed after the annual Shradh. Sapindikarana Shradh is performed before the annual Shradh. If Bharni Shradh is performed after that, it helps the deceased to get released from the pretayoni (Species of the dead). This is the name given to the Amavasya in the Pitrupaksha (In the month of Bhadrapad). On this day, Shradh is performed for all the pitars in the family. Even if Shradh is not performed evey day during the year or on other tithis of Pitrupaksha, Shradh should compulsorily be performed on this day since it is the last day of the Pitrupaksha. Maximum chanting of ‘Shri Gurudev Datta’ during the Pitrupaksha, helps the pitars gain momentum for their onward journey. Generally, the Shradh should not be performed during the transition period from one prahar (one-eighth of a day) to another, in the evening or at night and a time close to these times. 3. Where should a Shradh vidhi be performed ? Land that has a slope in the southern direction is appropriate for performing a Shradh. A place smeared with cowdung, so also a place without any insects, animals and inauspicious objects, is ideal for performing Shradh. Shradh should be performed in a forest, a Holy place or as far as possible on the ground floor of the performer’s house. When Shradh is performed in the performer’s house, the merit obtained is eight times that obtained by performing it at a Holy place. There is no prohibition on performing Shradh at places which are not owned by anyone, such as forests, mountains, banks of rivers or huge lakes, places of pilgrimage, temples etc. An eternal position is obtained after death if Shradh is performed on the banks of Holy rivers such as Ganga, Saraswati, Yamuna, Payoshni, etc. ; on a sea shore; at places of pilgrimage such as Prabhastirth, Pushkartirth, Prayag, Kashi, Gaya, Matrugaya, Kurukshetra, Gangadwar etc. ; in the forests such as the Naimishkshetra, Dharmaranya, Dhenukaranya etc. ; near the lakes of Brahmasarovar and Mahasarovar; at Akshayyavat, Mahakshetra (Names of places); and in the shade of gardens with tulsi (Holy basil plant) and amla trees. By offering pinda on the pretashila (Shila means a stone) at Gaya, the corpse state is destroyed and the soul goes to Pitrulok. A Shradh should not be performed in a cowshed, an elephant shed, a horse stable, on a stone seat and in a water-bed. If performed at such places, the pitars destroy the Shradh rites. Third day in a Hindu lunar fortnight.